Halloween Spirit: Holiday Inspired Fashion! In honor of Halloween we bring you our favorite edgy clothing and accessory picks. Get in the spirit with skulls, studs and leather. These uber cool fashion items are sure to keep you looking chic and trendy this fall. 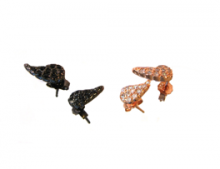 Get just the right amount of sparkle with these wing studs. Opt for the hematite plating with cubic zirconia pair for a spooky touch. We live in these! 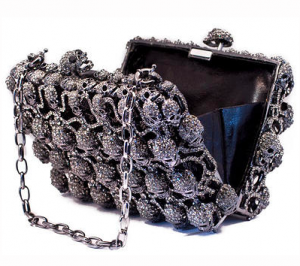 Real Housewives of Beverly Hills star Kyle Richards was recently seen rocking this beautiful gothic chic purse while out to dinner in Beverly Hills. You’ll want to really wear this bag— keep the rest of the look simple and let the bag do all the work.